The promise of hospice palliative care was that it would provide comfort to the dying, ease symptoms, and help grieving loved ones. Modern palliative care promises to be something even more — from the relief from symptoms, pain and stress of a serious illness, to improving the quality of life for both the patient AND families. Palliative care promises to offer comfort, choice, and respects patient’s values and wishes. It cares for not only the individual patient, but the whole family. That was the theory. The reality is that for some reason, it doesn’t seem to be working that way. 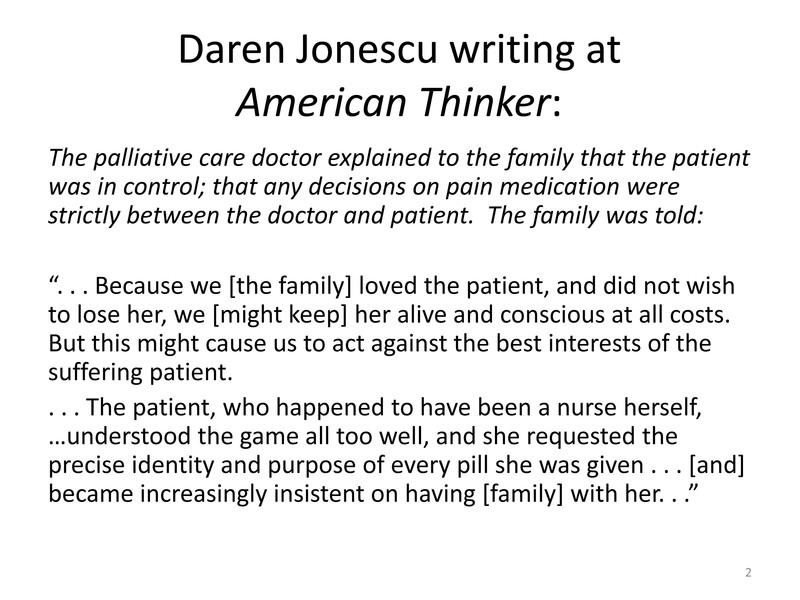 We hear stories such as that related by Daren Jonescu at American Thinker a while back. He wrote about a relative of his, an 85-year old widow, suffering from kidney failure and other chronic problems. She was mobile and mentally sound. “. 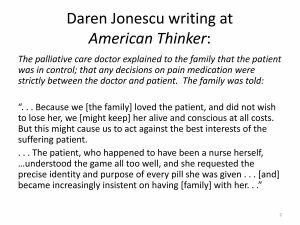 . . Because we [the family] loved the patient, and did not wish to lose her, we [might keep] her alive and conscious at all costs. But this might cause us to act against the best interests of the suffering patient. My father had no health care directive, but my sister was power of attorney, and despite all the reassurances that one can choose either direction, we had to fight to get a feeding tube, which as it turns out he only needed for 2 months and is now eating 3 full meals a day by mouth and wheeling around his nursing home again. I have a similar story myself. My father was 90 and had mild dementia when he fell and ended up with a neck fracture. We were told he was unable to eat without aspirating, but that he was not a candidate for a feeding tube because of the dementia. However, they told us that if we had a palliative care consult he would be allowed to eat, even without having a swallow test. Upon further questioning, we realized the nurse meant that by agreeing to comfort care we would waive our rights to have him fed properly so as to avoid aspiration. Apparently the palliative care consult would give them immunity if Dad choked and died. My sister and I declined a palliative care consult. A truly heroic nurse supervisor and a trauma PA broke the rules, rushed my father to radiology, and he was given a PEG. PS, his neck healed, and several months later he was home walking (slowly). Eventually the tube came out and he was eating on his own. He lived two years, and pretty happily so. There is more than anecdotal evidence as well. Research released a few years ago showed that non-palliative physicians themselves are generally unwilling to refer patients to palliative care. Look at the people and institutions who established it in the 1990s – they did not respect life. Problems within the Clinical Practice Guidelines – the defining document for palliative care. Now . . . let us examine each of these points in detail. Let’s look at the first item: Who was largely responsible for devising what we know as palliative care? Palliative care traces its roots to a collaborative that formed in the 1990s. Strategic funding from George Soros, the Robert Wood Johnson Foundation, and a host of others set the course. 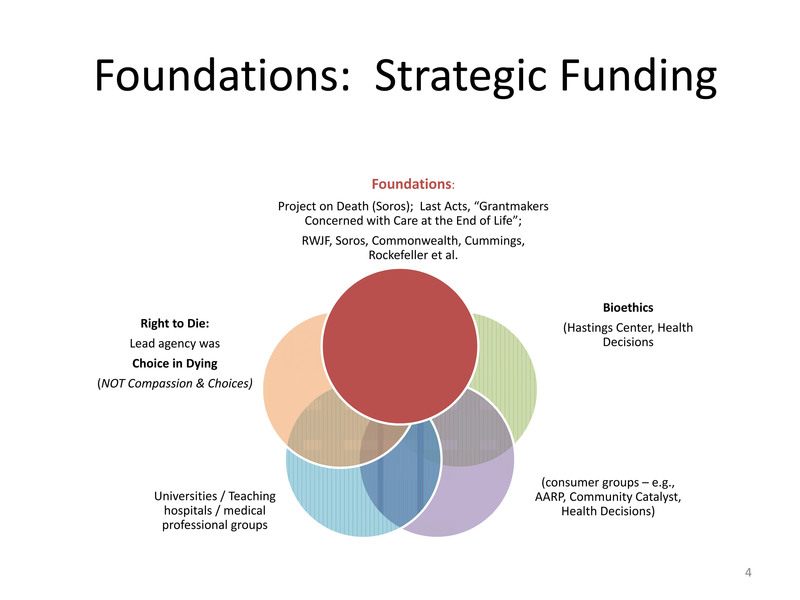 The grantmakers worked with doctors, bioethicists, as well as advocacy groups who were focused on the so-called right to die. 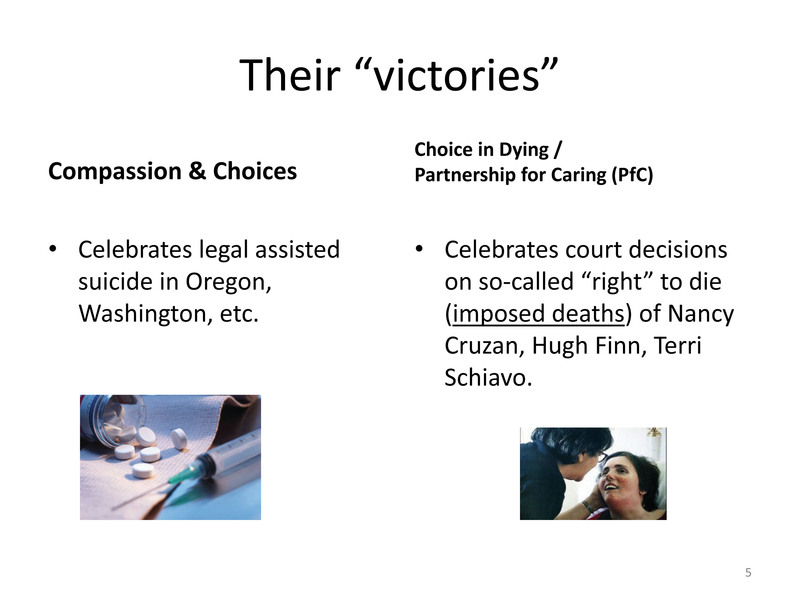 Those people fell into roughly two groups: Those devoted to legalizing assisted suicide (as in the case of Oregon); and those who focused on when it would be ok to withdraw medical treatment. The latter camp concentrated on issues such as when to withhold or withdraw treatment; who has the right to make those decisions, and when is a human being not a person. Here is how to visualize the difference in the two categories. 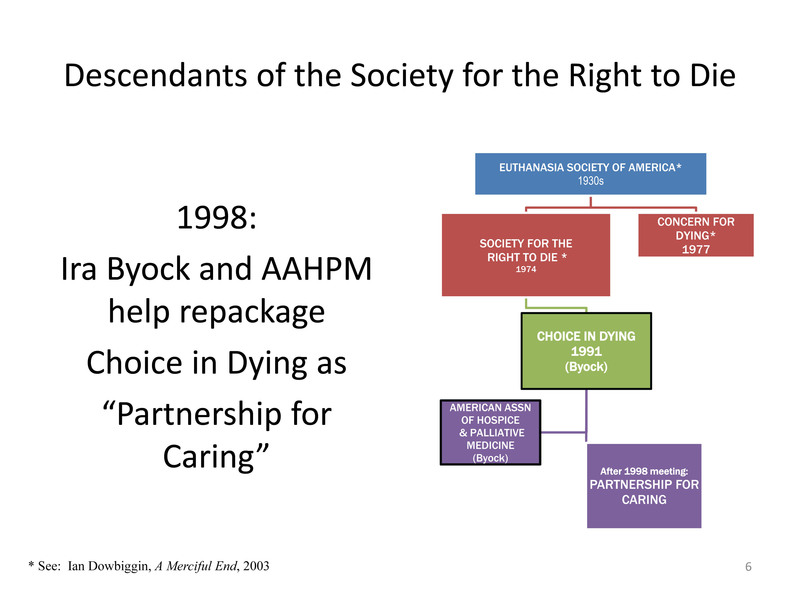 By 1995, the two camps were represented by two entities: Compassion in Dying, and Choice in Dying. Here’s a very simplified chart showing some of the name changes for that latter group. It traced its roots back to the Euthanasia Society of America way back in the 1930s. By 1991 they had adopted the name “Choice in Dying.” Seven years later they evolved yet again. Karen Orloff Kaplan and Ira Byock, both of Choice in Dying, announced the birth of Partnership for Caring – a blend of right-to-die and consumerism. 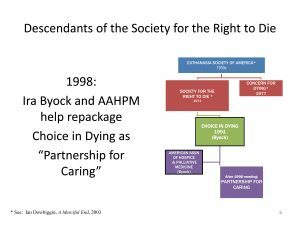 Byock was on the board of the American Academy of Hospice and Palliative Medicine, and that organization was the first to join the new Partnership. 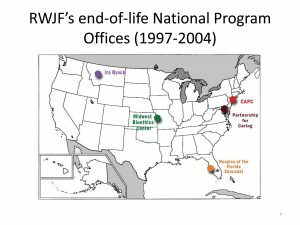 The Robert Wood Johnson Foundation (RWJ), the powerhouse funder of the grantmaking collaborative, set up several national headquarters to direct research, engage consumers, promote living wills, change institutions to operationalize the new norms that they were devising. 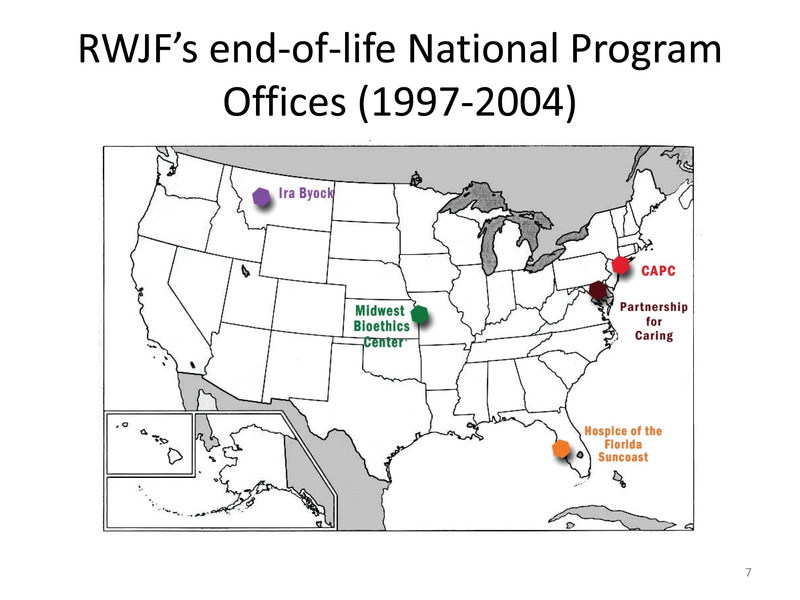 Because RWJ was high-profile and wanted to sidestep controversy (they were already drawing criticism for their open support of the Clinton health reform plan), they carefully engaged only members of the second camp – the Choice in Dying variety – to take the high profile leadership roles at their headquarters, thus avoiding the controversial assisted suicide issue. The collaborative developed a new model of care. One of the key elements of that new model was hospice in hospitals. It was an aspect of the care that was promoted by the Center to Advance Palliative Care (CAPC) at Mount Sinai in New York. In addition to moving hospice into hospitals, CAPC has developed tools for palliative care training – tools such as guidelines on when to refer patients to palliative care, how and when to use advance directives, and such. We’ll get into that a little more later. This slide shows CAPC’s success. 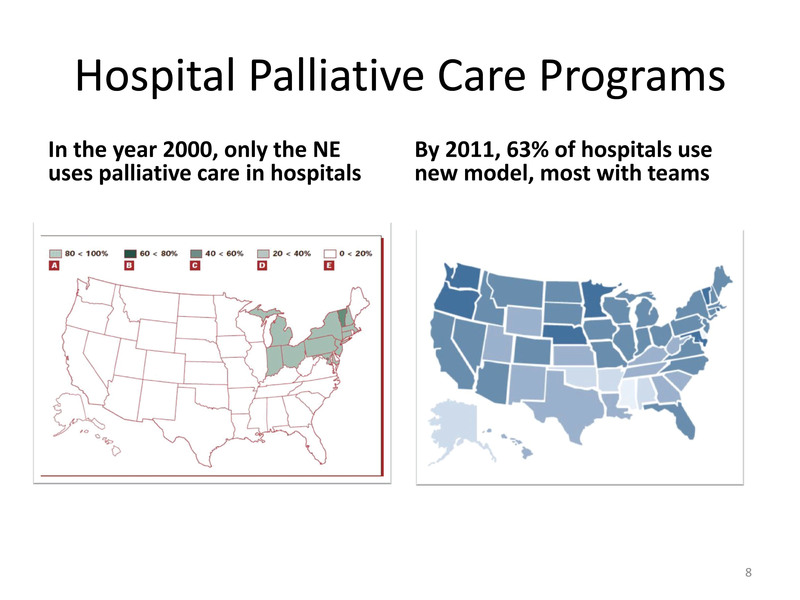 After about a decade, the CAPC brand of palliative care was in over 63% of American hospitals. The second reason why palliative care might not be living up to expectations is that COST-SAVING was in the plan to begin with. Robert Wood Johnson Foundation’s mission has always been about “efficient medicine” and efficient health systems. 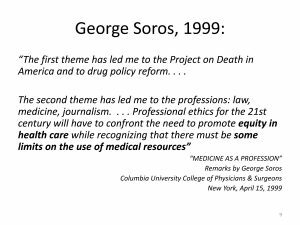 When they invested millions in that collaborative back in the ‘90s, they and Soros’s group – Project on Death in America (PDIA) – worked with Donald Berwick and Daniel Callahan, just to name two of their thought leaders who advocated health care rationing. “around 1994, I decided to devote more thought and money to . . . correcting the deficiencies of our own, open society. I settled on three major themes. 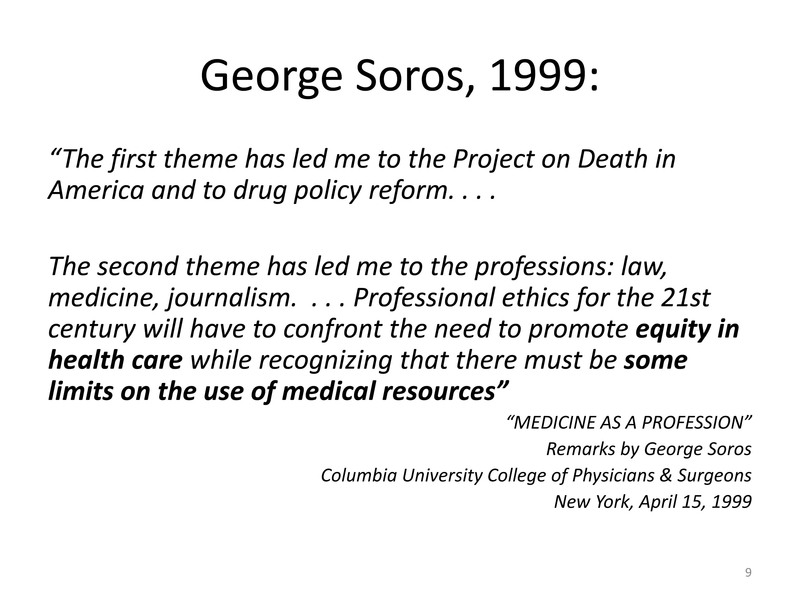 The first theme has led me to the project on death in America and to drug policy reform. 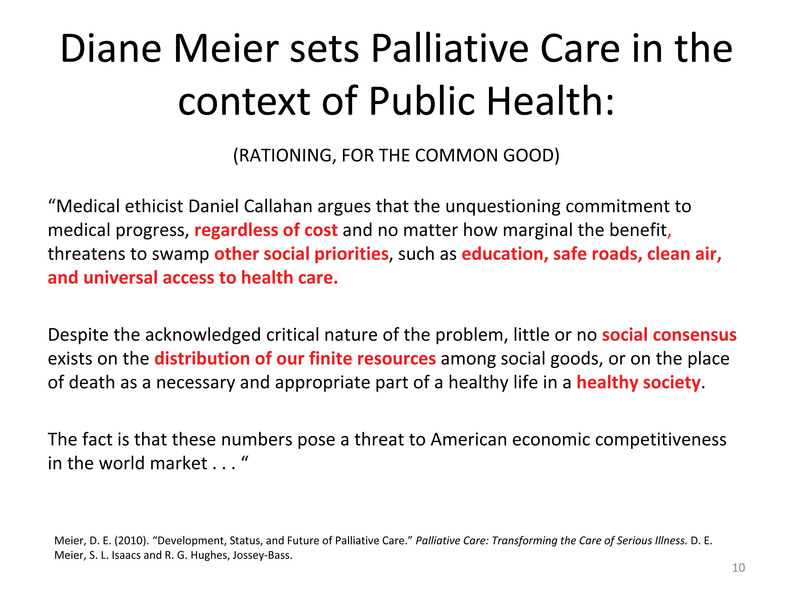 . .
“Daniel Callahan argues that the …commitment to medical progress, regardless of cost and no matter how marginal the benefit, threatens to swamp other social priorities, such as education, safe roads, clean air, and universal access to health care. Despite the acknowledged critical nature of the problem, little or no social consensus exists on the distribution of our finite resources among social goods, or on the place of death as a necessary and appropriate part of a healthy life in a healthy society. 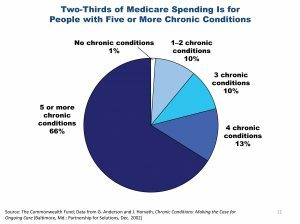 The palliative care patient population [is] the 10% of Medicare beneficiaries who have five or more chronic conditions. 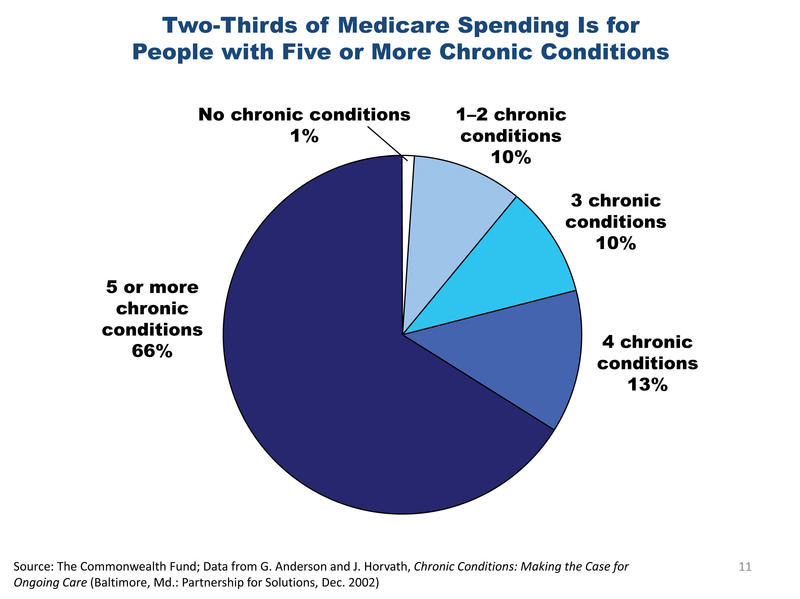 And that group of Medicare beneficiaries accounts for two-thirds of all spending. OK? So 90% of all Medicare beneficiaries spend almost nothing. They’re healthy. They don’t need much. The sick Medicare beneficiaries are driving the overwhelming majority of spending. . . .
if we intend to get a handle on costs, and improve quality at the same time, it will not be possible without fully integrated palliative care. 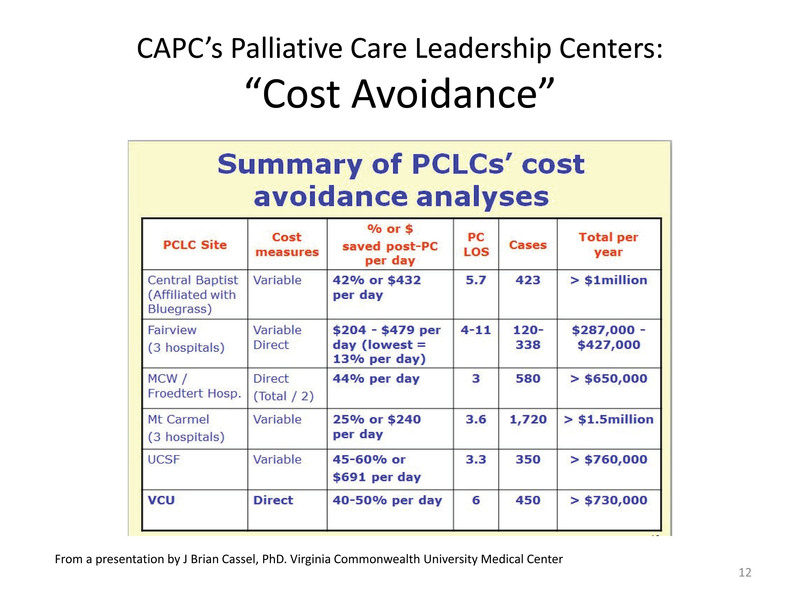 The National Palliative Care Research Center – the research arm of CAPC – published results of a study a few years ago that made the case for palliative care as a cost-saving device. 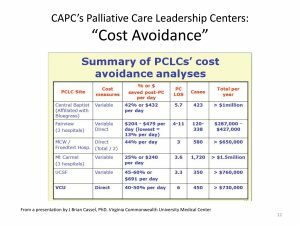 By their estimates, moving people to palliative care saved $370 per day per palliative care patient; up to $4900 on each admission of a palliative care patient, and $2.5 million per year for the average academic medical center. Another study shows that palliative care promises “improved throughput, especially in ICU, where length of stay issues will be a major problem due to reduced hospital bed capacity.” Think about that for a minute. . . . the technocrats are measuring how quickly they can move people in and out of the ICU – like an assembly line… . not only that, they are planning for a shortage of beds, rather than finding ways to open up more. 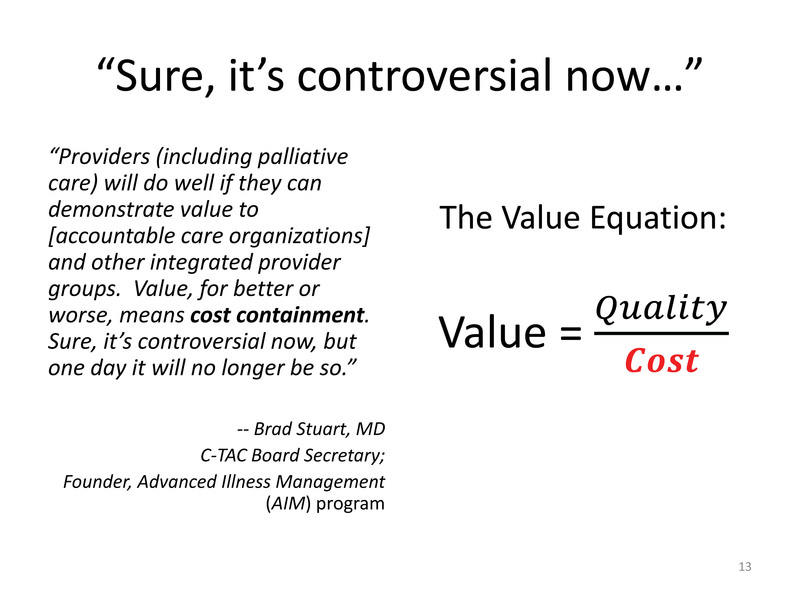 NOTE: “Value” can be increased either by lowering “Cost” or by increasing “Quality.” However, “Quality” is subjective. 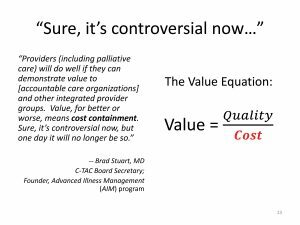 Providers (including palliative care) will do well if they can demonstrate value to [accountable care organizations] and other integrated provider groups. Value, for better or worse, means cost containment. Sure, it’s controversial now, but one day it will no longer be so. 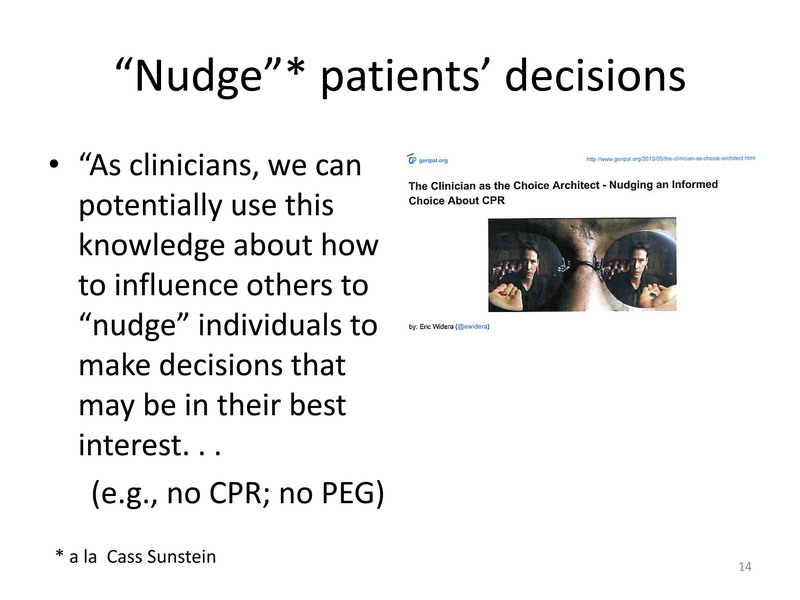 Then we have another palliative care doc — Director of the Hospice & Palliative Care Service at the VA in San Francisco, Hastings Center award-winner, and assistant professor at UC-San Francisco’s medical school, who is calling for doctors to be “choice architects” and, a la Cass Sunstein, “nudge” patients into decisions that he terms are “in their best interest.” He wants doctors to use videos of cognitively disabled patients to convince families not to ask for feeding tubes for their loved ones. In multiple studies, most patients rate survival, even for a short period of time, as more important than an improved quality of life. Even hospice patients want to undergo treatments that, in their providers’ minds, are not in their best interest. 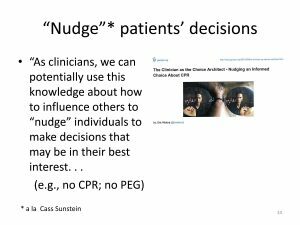 As one blogger at a palliative care site noted a few months ago, it would be easier to believe that this interest in limiting non-beneficial treatments is really in our patients’ best interest if the people who are doing the convincing would stop linking it to cost. Despite right-to-die propaganda for the past 20 years telling us that patients fear the technological imperative and don’t want to die hooked up to machines, in fact it appears that the public really wants to give life a chance if at all possible. The “quality of life” imperative is not as important to them. But there is a problem with that; it’s going to cost too much. The third issue is the new model of healthcare. 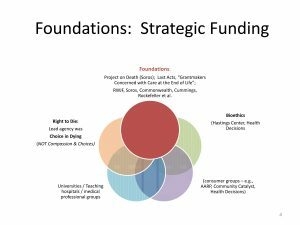 The Robert Wood Johnson Foundation and Soros projects in the ‘90s were all about developing “a new model of care.” Here, on the right, is a graphic illustration of that model. It is based on a model that was introduced in Canada years ago. On the left is a view of traditional hospice within traditional medicine. In the traditional model, curative and restorative treatments are maintained until the patient enters hospice. By contrast, the New Model introduces palliative care at the onset of a diagnosis, and gradually tapers off restorative treatments, replacing the life-supporting treatment with palliative care. As Elizabeth Wickham has noted, “in the beginning, palliative care applied to cancer patients. The traditional (old) view of palliative care was associated with volunteer hospice care for these patients. The current (new) view of palliative care is not only for cancer patients.” For example, the model is applied to dementia patients, whose diagnosis and prognosis is far less predictable than that of cancer patients. In the new model, a patient is put into palliative care at the point of diagnosis. So how does a hospital know when to advance the patient into higher levels of palliative care? Here are some suggested “triggers” for palliative care that came out of CAPC. Notice that any one of these criteria, along with a “serious illness” – a vague term at best – will trigger a consult. The criteria range from “Declining ability to complete activities of daily living” (yes, that happens when you’re sick), to “conflicts regarding the use of non-oral feeding/hydration in cognitively impaired . . . patients”. Cognitively impaired could mean dementia, or stroke, or a developmental disorder. That’s a pretty broad range. And “conflicts” probably translates into “the hospital doesn’t want a PEG tube, but the family does. The literature is replete with advice for palliative care professionals on how to manage families who want feeding tubes to give their loved ones a chance to live, but scarcely an article exists by a palliative care researcher on how to argue FOR a PEG. One trigger that is frequently used, but is not listed here, is what they call “the surprise question.” In that scenario, if the clinician looks at the patient and thinks “I wouldn’t be surprised to see him dead in a year”, then the patient is re-routed to palliative care. That takes us to the fourth issue: regulation and the bureaucracy. Also, ironically, palliative care – the profession that has spent two decades disparaging the technological imperative, has been making hay out of the federal electronic records imperative. 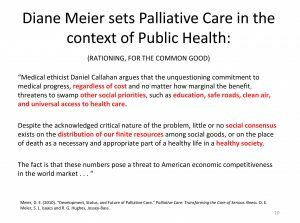 We seem to be headed toward a system that looks very much like a factory assembly line, and the palliative care coalition is cheering it on. This map is a graphic representation of another bureaucratic nightmare that Washington has generated. One of the goals of health reform is to streamline how patients move from one facility to another. In conjunction with that effort is a program to reduce hospital emergency room admissions or readmissions. Last October CMS began penalizing hospitals for readmitting too many patients within 30 days of their stay at the hospital. So if Granny is discharged from the hospital today, but gets sick again and has to run back to the emergency room within 30 days, the hospital might be fined if she is admitted. This is causing hospitals to look for ways to transfer some patients to places rather than admitting them to the hospital – transferring them to palliative care, for example. What you see on this map are demonstration projects, most working off of federal funding one way or another, all with the purpose of streamlining the system and reducing hospital admissions. Finally, the fifth issue: Problems with the Clinical Guidelines for Quality Palliative Care. To start, the guidelines are the result of a CONSENSUS process – consensus among members of the collaborative, essentially. The few people who met in New York in 2001 appointed 20 members as a steering committee. The majority of the members were part of Project on Death or Last Acts. Partnership for Caring was put in charge of administration. The Clinical Guidelines emerged from a small meeting at the NY Academy of Medicine, to become a document with the force of law. The framers pulled the guidelines from similar documents already established in Canada, Australia, New Zealand – all countries with, coincidentally, universal health coverage (socialized medicine). 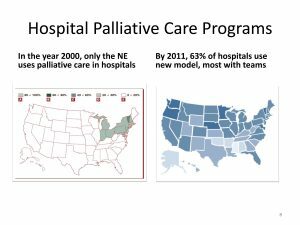 The objectives reflected the consensus of both the hospice and palliative care communities – the National Hospice and Palliative Care Organization (NHPCO) and the American Academy of Hospice & Palliative Medicine (AAHPM). A few years ago William Colby (the attorney who argued in favor of Nancy Cruzan’s death) and Constance Dahlin (editor of the most recent edition of the Consensus guidelines) collaborated on an article published in HEC Forum – a hospital ethics journal published in the Netherlands. The article concerned Domain 8 of the Clinical Guidelines; that is, the portion of the guidelines concerning “ethical and legal aspects of care. The authors make two points that I feel are very important. [D]uring the public wrangling over the Terri Schiavo right-to-die case . . . commentators and advocates argued that we should “let nature take its course.” Interestingly, people on [both sides] of the dispute made this statement – leave the tube in, or take the tube out – and let nature take its course. 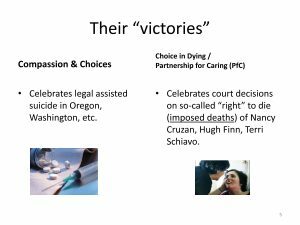 In other words, “let nature take its course” – that is, allow a natural death – the same words meant different things depending upon whether you were a right-to-die advocate or opposed Terri’s death. For the right-to-die people, Terri’s death was a natural death. The right-to-die authors of this article conclude that the time has come to devise these ethical and legal Guidelines because, as they say, “the time of nature taking its course for serious illness is over.” The authors argue that these days people die from “conscious decisions” made, in the authors’ words “together between patients and … providers” to stop the use of antibiotics, artificial nutrition, and so forth. SECOND, they note that although the Guidelines are voluntary consensus guidelines, they have special legal status within the federal government. Government regulators have a natural tendency to use such standards in setting regulations for industries, like healthcare, whenever possible. The guidelines, then, have the force of law. Given an ethical framework that positions the death of Terri Schiavo as “a natural death,” or as a matter of living wills, combined with a health reform system built on the Nudge of Cass Sunstein, what are the odds that with these ethical and legal guidelines and preferred practices, patients will be nudged toward imposed death? The hope — the promise — of palliative care was that it would protect patients who might otherwise contemplate suicide rather than face what they fear would be a “bad death.” That was the plan: to provide a safe “third path” for patients when they come to the fork in the road that seems to force a choice between unbearable pain, or willful end of life. The plan might have worked if this were a perfect world; if palliative care were merely symptom relief as it was in the old days, and if the system were not rigged in favor of a third path to imposed death. In spite of a system that is rigged to cut short the lives of the weakest and most vulnerable among us, there are many brave and conscientious doctors and nurses out there defending human life. They are our first line of defense. This entry was posted in C-TAC, Care Coordination, Care transitions, Center to Advance Palliative Care (CAPC), Electronic Health Records, Informed Decision Making, Obamacare - Affordable Care Act - ACA, Palliative care / palliative medicine, POLST and tagged advance care planning, Care transitions, Clinical Practice Guidelines, CMMI, electronic health records EHR, forgoing treatment, health reform, rationing, shared decision making by Ione Whitlock. Bookmark the permalink.